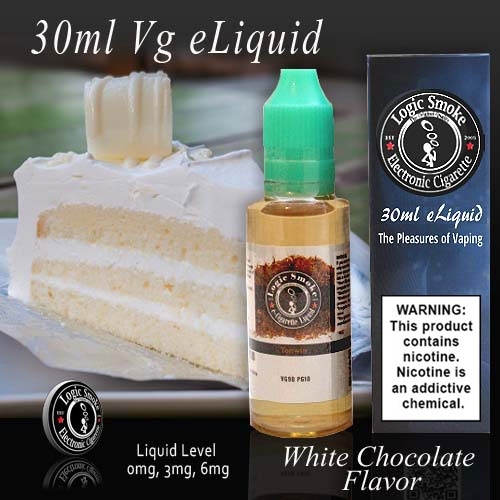 The subtly sweet flavor of rich and creamy white chocolate is the taste you'll soon come to crave in our White Chocolate flavored electronic cigarette e-liquid. This is such a lovely flavor that makes a perfect, guilt-free late night "snack" or can easily be mixed with Logic Smoke Strawberry, Blueberry or Raspberry. This tasty e-liquid will give you hours of vaping pleasure, especially when vaped in your favorite high powered MOD unit. This special formula was created to give you the biggest, fattest vapor possible for your vaping pleasure. Try vaping White Chocolate all by itself or mix in with some of our other gorgeous e-liquid flavors. Mix with any of our berry flavors for a fabulous taste explosion. Tantalize your taste-buds by mixing with Cheesecake flavored e-liquid for luscious pastry perfection.